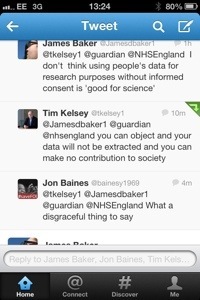 Why are proponents of care:data resorting to rudeness about those who are not as convinced as they are? When I attended the launch of MedConfidential in April of this year I was largely ignorant of the proposals to amass patient data by the Health and Social Care Information Centre (HSCIC) under the banner of care:data. I was concerned by what I heard, and I remain so: details were unclear and in many cases remain so, regarding what data will be gathered, and how, and for what purposes, and what arrangements will be to allow third party access to it, and whether or to what extent it will be anonymised, and whether patients’ consent will be sought, or assumed, or ignored. What I did see, and was greatly impressed by, was a large group of people, from various backgrounds and roles, coming together, mostly on a purely voluntary basis (for instance, I took a day’s leave to attend), to discuss the implications of this. The centralising and use of patient confidential data raises questions of profound importance, which don’t have easy answers: such as to what extent should people waive an expectation of privacy in order – for instance – to further medical research? These are issues which led two of my favourite bloggers to come to (digital) blows recently. This is nasty stuff, and leads one to wonder why she feels the need to resort to such a rhetorical device. Kelsey appears to have deleted his tweet now, but the underlying disrespect for those who don’t share the vision can’t be so easily erased. Yes, you’re right. He also bizarrely says that no offence had been intended.